The words “gluten free” may drive many people away from a recipe. Even I tend to be nervous cooking with foreign flours. We think it will be a dried out rock, that has no resemblance to gluten baked goods. Before you turn your back, give this one a try. These muffins turned out more moist and full of flavor than I would have ever imagined; you would not even know it was gluten free. Cook for one occasion, or in bulk to freeze for the winter months and enjoy. Note: You may need to add maple syrup if walnuts are not sticky enough. This will help it stick and harden to the muffin. In a smaller bowl combine coconut flour, coconut flakes, salt, baking soda, ground ginger, and spices. Add the dry ingredients from the small bowl into the larger bowl with the wet ingredients. Mix well until everything is well incorporated. Be careful, your coconut oil may start to harden. Don’t worry, you can bring the mixture next to a fire or put in the oven for a minute to allow it to melt again. At this point your mixture should be pretty wet. You want it this way; it will help keep your muffins moist in the end. Oil your muffin pan with coconut oil. Pour mixture into the muffin cups about 3/4 full. While muffins are baking, prep your candied walnuts. Melt butter in a small saucepan on low heat. Add chopped walnuts and coat in butter. Stir in sugar and cinnamon until coated. 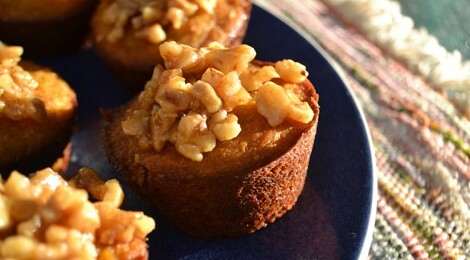 When muffins are done, top with walnut mixture. If the walnuts don’t stick, add about a tablespoon of maple syrup.